Since my wife got her Chumby, I've been reading up on ActionScript. It's not been a terribly amusing process, and I haven't had much time to devote to it, so I haven't gotten any further than a prototype recipe chumbifier widget so far. Then the other day I was perusing the available widgets on chumby.com and came across, in the web-cams sections, a widget that will display and poll an arbitrary image given a URL. 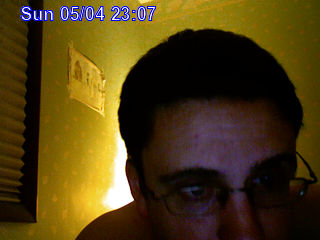 I thought it might be fun to make a self-spy cam, as it were, and have my MacBook upload the iSight camera image every few minutes while I was work. Then my ugly mug would show up on my wife's Chumby, between Chuck Norris Facts and the San Diego Zoo's panda cam. My first thought was to use Automator for this task. It has iSight support, and Transmit has Automator support, so it should have been pretty easy to take the picture and upload it to one of my websites. 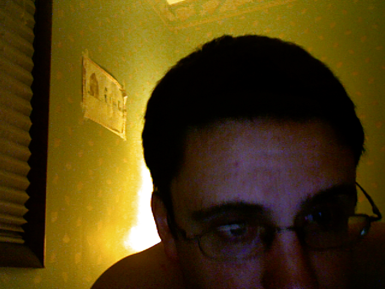 But Automator apparently insists on doing the 3-2-1-beep/flash means of taking a picture, as in Photo Booth. Putting up with that every few minutes would be irritating to say the least. So I did a quick google and came across isightcapture. isightcapture is a command-line application that captures an image from your iSight camera and saves it to file. It was a simple matter to put together a shell script to capture the image and then use scp to upload it to my web host (I already had SSH public key authentication configured on the host, so I didn't need to worry about having to enter a password). So far, so good; but there is room for improvement: 1) at 640x480 it's twice as big as the Chumby wants; 2) how would my wife know when the picture was taken? isightcapture can resize the picture, but let's pretend it can't. My wife likely doesn't care when the picture was taken, but let's pretend that she does. Humour me here, okay? +contrast +contrast +contrast -noise 3 -resize 320 -stroke blue -fill white -pointsize 18 -font Arial-Bold -annotate +20+20 "$(date '+%a %m/%d %H:%M')"
Great! We now have an automatically-annotated image. Now all that remains is to automate the process of running the shell script every few minutes, so that the image the Chumby will download from the website will actually change. Save your script out as an application. In my case I made it grabme.app. This example will take a picture every 15 minutes between 10am and 5:45pm, Monday through Friday. So now we have our image automatically captured and uploaded when we want it to. The next step is to configure the Chumby to display the image. 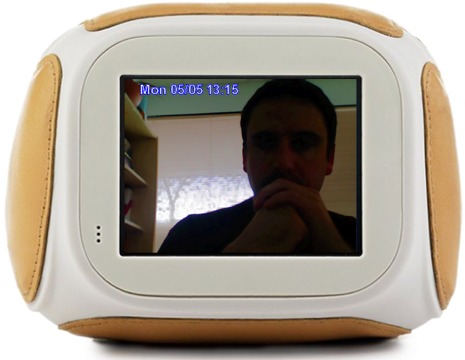 In the widget selector on chumby.com, go to Webcams and then choose Load Image From URL. Put the widget in the channel you of your choice and then customize it with the URL your image is available at. Be sure to select the prevent Caching radio button.